Photograph of Buddhist sculpture from Mian Khan in Peshawar District. 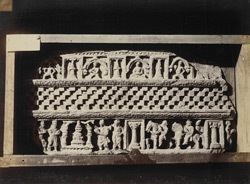 This print shows a carved panel depicting worship of a stupa, boxed for transportation. According to Bloch, the panel was, 'said to be in Bombay'.